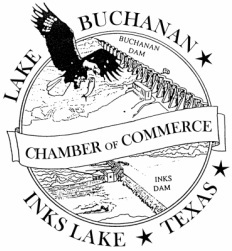 Note: This profile centers on the E side of Lake Buchanan, from the N end down to Buchanan Dam, and includes the sub-divisions and surrounding areas, such as Canyon Of The Eagles, Silver Creek, Donali, Cassie, Council Creek, Buchanan Dam, and more. Locally this greater area is know as "East Lake Buchanan" or simply "East Lake". Buchanan Dam: 512-793-3000. 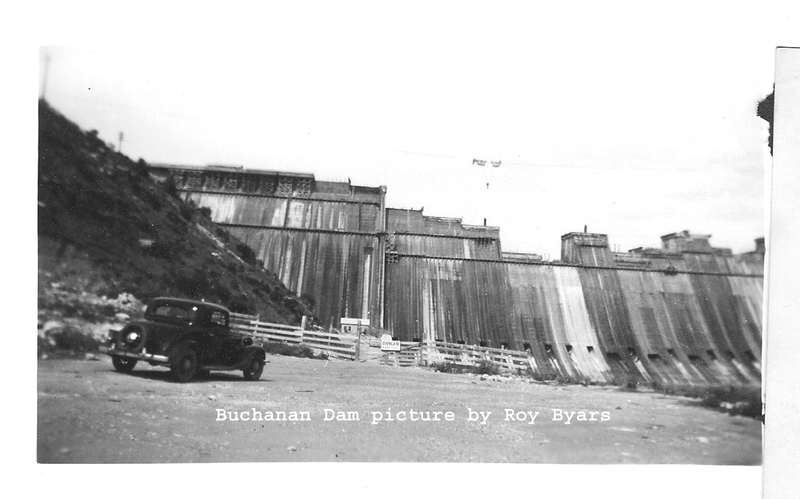 Built by the LCRA in 1939, it is the largest multi-arch dam in the world. Open for visitor viewing. 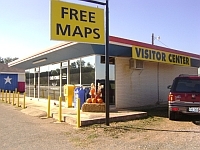 See museum and visitor center below. Part of Highland Lakes area (see Highland Lakes). Also locally referred to as Inks Lake Bridge. 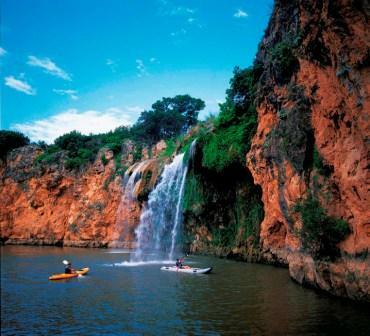 Vanishing Texas River Cruise: This 2.5 hr tour in an enclosed boat with 2 observation decks allows visitors to see the spectacular wilderness and wildlife (including eagles) along the Canyon of the Colorado River that feeds into the lake. Canyon Of The Eagles Lodge & Nature Park: Eagle Eye Observatory, Conference Center, restaurant, lodging, camping and RV facilities. Buchanan Nesting Eagles: During the winter a now famous couple of eagles nest in a tree along TX-29 on the other side of the Llano River. There is pull-off near the nest area to give people a place to stop, and sometimes traffic accumulates. Arrive early in the morning and you might catch a glimpse of the eagles perched on one of the big trees or flying around as they hunt. Their nest can weigh over 800 pounds. Further, the canyons in the upper Lake Buchanan and Colorado River area draw about 15 pair of bald eagles and two pair of golden eagles during the winter. Sighting updates often posted at the Chamber web site above. Local city & county parks include: County Park on FM-2341, very small park on E side of lake, with concrete boat launch ramp. HISTORY: Handbook Of Texas Online: "It was initially the site of a construction camp established to build the first of the major flood-control and power-generation facilities on the Colorado River. The project was originally known as Bluffton Dam for the nearby town of Bluffton, but the name was changed to Hamilton Dam, perhaps because its location had been surveyed in 1926 by an engineer named Hamilton. Some say it was named after G. W. Hamilton, vice president of the Middle West Utility Company of Chicago, a company that represented the Insul interests active in developing electrical power distribution in Texas. The Emery-Peck and Rockwood Development Company undertook the construction of the dam in 1931 and established a post office and a settlement of several hundred workers supported by commercial, medical, and recreational facilities. In 1932 bankruptcy forced the closing of the project. United States Congressman James Paul Buchanan secured federal funds to revive the project in 1934, whereupon the dam, post office, and town were renamed in his honor. 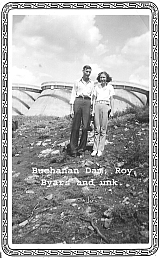 The dam was dedicated on October 16, 1937. The town grew steadily as a recreational center, reaching a population of over 1,000 in 1974, when it had numerous businesses. In 1990 the population was 1,099, and in 2000 it had grown to 1,688." The filling of the lake forced Bluffton to relocate 5 mi west. The abandoned community then was under water. A drought in 2011 caused the lake's water level to drop significantly, exposing the remains of the original town of Bluffton. NOTE: Because of postal/mail addressing, also look at listings on our Burnet page. BUCHANAN ARTS & CRAFTS GUILD: 512-793-756-7636; 17534 TX-29 E, Buchanan Dam, TX 78609-4409. Local artisans share their work, attend classes, exchange ideas, exhibit and art. THUNDERBIRD RESORT & EVENT CENTER: 512-756-4878; 200 Greenwood Hills Trail, Burnet, TX 78611. www.thunderbirdvacation.com. Cottages, marina, boat ramp & slips, watercraft rentals, including pontoon & deck boats, canoes, kayaks fuel. VANISHING TEXAS RIVER CRUISE: 800-474-8374; 512-756-6986; 16942 RR-2341, Burnet, TX 78611. www.vtrc.com. At Canyon Of The Eagles Lodge & Nature Park (see separate listing). Boat tour originates at N end of Lake Buchanan. This 2.5 hr tour is in an enclosed boat with 2 observation decks to see spectacular wilderness and wildlife (including eagles) along the N canyon of the Colorado River that feeds into the lake. CHAPEL OF THE HILLS BAPTIST CHURCH: 512-793-2453; 19135 TX-29 E, Buchanan Dam, TX 78609. www.hillcountrychapel.com. Linda Bryant. A non-profit food pantry (partner with Central Texas Food Bank). EDGEWATER RESORT ON LAKE BUCHANAN: 512-793-2818; 224 S Winding Way, Buchanan Dam, TX 78609. www.the-edgewater.com. Fully furnished waterfront cabins & RV Park, Drive-thru RV spaces with 4-way hookups, large air-conditioned meeting room w/full kitchen, swimming pool, boat ramp, fishing pier, washateria, Wi-Fi. Welcome Family Reunions, Pets And Winter Texans. PAINTED SKY INN: 512-715-9896; 1400 CR-128, Burnet, TX 78611. www.paintedskyinn.com. On NE shore of Lake Buchanan. Non-motorized watercraft rentals, including stand-up paddleboards, fishing and recreational kayaks, canoes and accessories. Classes offered by appointment. THUNDERBIRD RESORT & EVENT CENTER: 512-756-4878; 200 Greenwood Hills Trail, Burnet, TX 78611. www.thunderbirdvacation.com. Cottages, boat ramp & slips, watercraft rentals, including pontoon & deck boats. BUCHANAN MACHINE: 512-793-2864; TX-29, Buchanan Dam, TX 78609. BUCHANAN SEPTIC TANKS: 512-793-3100; 15648 TX-29, Buchanan Dam, TX 78609. Tanks, pumps. EAGLE EYE OBSERVATORY AT CANYON OF THE EAGLES RESORT: 800-977-0081; 16942 FM-2341, Burnet, TX 7861 (postal address, but actually much closer to Buchanan Dam). 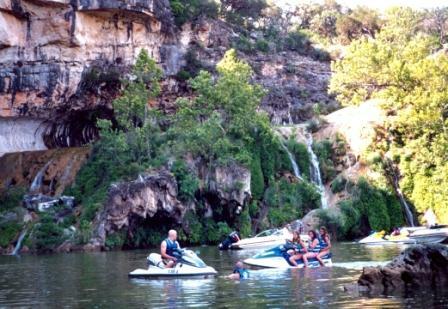 www.canyonoftheeagles.com; and Highland Lakes. An LCRA and private entity partnership. LAKESHORE BRANCH LIBRARY: 325-379-1174; 7346 RR 261, Buchanan Dam, TX 78609. http://llano-library-system.net. A branch of the Llano County Library System. A non-profit. 24/7 free Wi-Fi accessible in the library and outside. Online catalog with access to TexShare databases. Online access to the library web page to search the catalog, renew titles and check our library calendar. Public internet computers with high speed connection and Microsoft Office. Color laser jet printer and self-service copier. Free Interlibrary Loan between all Llano County branches. Interlibrary Loan outside Llano County incurs a $3.15 per item postal charge. A library card obtained at Lakeshore is also valid for all services at Llano and Kingsland Libraries. Books, large print books, audio books, DVD movies, magazines and local newspapers. Year round Book Sale with great prices. Hours: Mon-Fri 9a- Noon, 1p-5:30p; Closed Noon-1p. 512-793-5463; 9150 RR 1431 W, Buchanan Dam, TX 78609. www.christ-yoder.org, www.cityofburnet.com/public_safety/animal_control.htm, Facebook-CYAS, HCHC. Map. City of Burnet owned, and operated by the HCHC/SPCA. No animal turned away. All animals are cared for in their best interest; individually, kindly and humanely. Serves Burnet and Llano counties. MISFIT TRAILS RESCUE AND SANCTUARY: 512-248-8134; 1701 Roselea Dr, Buchanan Dam, TX 78609. Facebook. Mission is to provide ALL animals (no matter shape, style, breed, or age) that have been abused and abandoned, a safe and loving environment until they find their forever homes that they deserve. OVERLOOK RESTAURANT: 512-334-2070; 16942 FM-2341, Burnet. www.canyonoftheeagles.com. At Canyon Of The Eagles Resort, see separate listing. 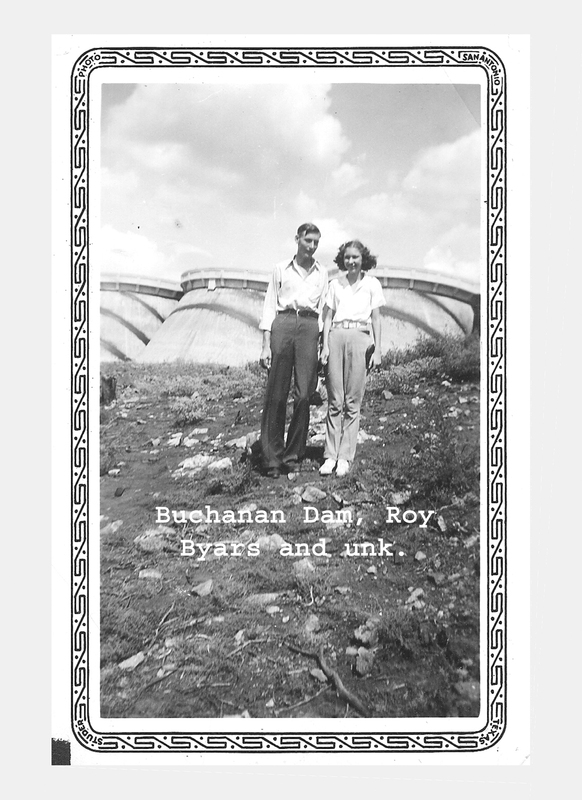 PARDNERS: 512-793-2432; 15615 TX-29 E, Buchanan Dam, TX 78609. Facebook. Night club, open Wed-Sat. BLACK ROCK PARK (LCRA): 512-793-3138; 3400 RR 261, Buchanan Dam, TX 78609. Fifteen RV sites have beautiful Lake Buchanan views. SW shore of lake. See Parks for more details on this LCRA park. CANYON OF THE EAGLES LODGE & NATURE PARK RESORT: 800-977-0081; 16942 FM-2341, Burnet, TX 7861 (postal address, but actually much closer to Buchanan Dam). www.canyonoftheeagles.com; and Highland Lakes. An LCRA and private entity partnership. CHAPARRAL TRADING POST/RVs: 512-756-9909; TX-29 W, at Hoover's Valley Rd (CR-116), Buchanan Dam area. Note: Schooling is provided by Llano ISD in Llano.